is to make it memorable. I firmly believe that FUN = Memorable for kids. those basics, like ABC's, Colors & Sight Words, that can get boring - FUN! I turned Twister into a fun learning game for the Lil Divas. countless laughs and lots and lots of learning. 2. Play, Laugh & Learn! The Road to Reading can be FUN! Check out our other Sight Word Fun for more ideas. "Add a Little Learning to Your Playtime"
blog hop to celebrate A Mom with a Lesson Plan's 1st Blogaversary! 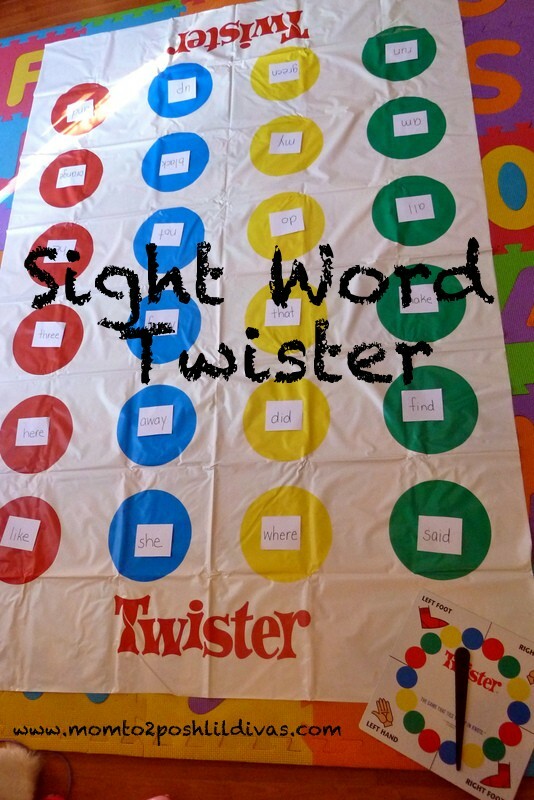 I love this twist on sight word Twister! Thank you for linking up!!! i love your blog, and this idea is amazing!! I will defintly be doing this! I also loved your little phrase "the road to reading can be fun" and you have made it very fun! Great idea! I loved Twister when I was a kid and now wish we had used it like this! It looks like your girls loved it. My kids would go crazy over this. I have two that are just learning to read right now. What a fantastic idea! This is a fantastic idea! I love it. You could adapt it to learn so many different things. Genius :D I've shared and pinned. Stumbling soon. Thank you for posting! Oh, I think I am going to have to pull out our Twister game and try this idea out! Thank you! I just this link and I am excited to use the idea for my Pre-K class with letter, number and color recognition!! They will have fun with this! My girls LOVE playing it & we have used it in various ways - never gets boring since it's hilarious to play Twister in general. oh, that's a GREAT one! Be sure to share photos on my FB wall or something - would love to see it! Fantastic activity! I'm imagining having matching pairs of favorite comic strip characters, cut from the newspaper and pasted onto heavier cardstock or a birthday "wish list" of matches. Great opportunity to practice scissor accuracy, gluing, matching...Thanks for the wonderful idea! K.
Love this! SO excited about the possibilities! And I love your phrase "Fun = Memorable." So true! Love this! Going to use it for multiplication fact review! How do you do the calls for them to put their feet and hands on? Are there any words on the mat in more than one color circle? The Goodwill Store has Twister and many wonderful games and books for the classroom and very reasonable! oh wow I wrote this idea down the other day, and looking tonight I see you also had this great thought. Great minds think alike is true. I found this and decided I had to make one. I made one small change I took Basball Trading Card plastic sleeves and ran them through my Xyron Sticker maker and put one on each circle, so that I can put the word cards in the sleeves so the cards do not get all bent up from play. Love this! Thanks for the idea! My kids love Twister! I'm sorry if I'm a little dense but how would you play this? You would put sight words on the circles. The person with the board would spin it and read what it lands on. For example, if the black arrow landed on Right Foot Red, you would say Right Foot "and" or whatever the sight word was.